Subit, D.; Arregui-Dalmases, C.; Salzar, R.; Crandall, J.R.
Subit, D. [et al.]. 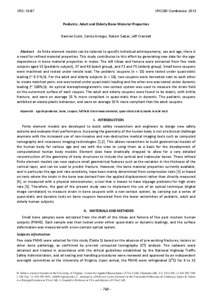 Pediatric, adult and elderly bone material properties. A: International Research Council on the Biomechanics of Injury Conference. "2013 IRCOBI Conference Proceedings". Gothenburg: 2013, p. 760-769.